Brickbottom Artists Association‘s, “Between Straight Lines” examines the way in which the medium of serial images – ranging from graphic novels to Japanese manga – has allowed artists to “survey the changing landscape of the LGBT community.” The exhibition will be on display until June 25. Small Obsession: Artists’ Dollhouses and Other Obsessively Small Works of Art, the new exhibition at the Somerville Museum, examines 20 artists whose work ranges from sculpture to photography to oil painting to architecture. The underlying current in all of their work is the fact that all artists bring fresh perspective to miniature worlds. The Washington Street Art Center is celebrating the opening of its new exhibition. “Multiple/Unique” examines the work of Mastwood Press artists Ira Cummings, Rachel Mello, and Rachel Silber. The exhibition will run until June 25. Boston’s best circus performers will descend up the Armory to usher in a Reign of Revelry this weekend. The group will find magic in the mundane with the help of Emperor Norton’s Stationary March Band, jugglers, belly dancers, aerialists, contortionists, burlesque performers, acrobats, hoola hoopers and more. Tonight’s performance is NOT family friendly; the show is 18+. A family-friendly performance will be held Saturday afternoon. Tickets are $20 in advance and $25 at the door; there is an additional $1 service fee. You can buy tickets here. Music blog Playground Boston will be hosting a benefit concert tonight at Rosebud Bar. The line-up includes Black Thai, Gozu, Phantom Glue, and Cocked n Loaded. In addition to the show, the benefit will also feature a raffle; prizes include concert tickets , gift certificates to local retailers including Stingray Body Art, Tasty Burger, and Coda, and much, much, more. All proceeds will benefit the relief effort in Japan. Doors open at 8 p.m.; tickets are $5; 21+. “Equus” just may be the only award-winning dramatic play to have featured a naked Harry Potter on stage. However, that tidbit is not why it’s award-winning. The dramatic masterpiece, which is being produced by Theatre@First and performed at Unity Somerville, explores a young man’s violent crime and the realizations of the psychiatrist to seeks to help him. “Equus” contains mature content and strong language. Tickets are $15 for adults; $12 for students & seniors. This show/dance party promises to be “just like your high school prom, minus the drama, crying, and jealousy (but possibly including the 4 a.m. passing out on the neighbor’s lawn.” Formal wear is encouraged, as there will be a photographer on hand to take your grown-up-prom picture. The line-up includes Gondoliers, Initials B.R., Volcano Kings, and DJ K-Ho and friends. Doors open 8:30 p.m.; tickets are $10; 21+. The Union Square Farmers Market returns for its second installation of the season. The market, which is slated to run through October 29, offers everything from fresh produce to specialty foods to live music. Clowns, acrobats, jugglers and other acts will bring fun and magic to the Armory in a family friendly matinee performance of Boston Circus Guild’s Reign of Revelry. Adult tickets are $15 in advance and $20 at the door; children’s tickets are $10 in advance and $15 at the door. Advance tickets may be purchased here. 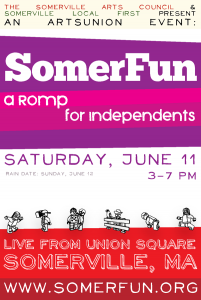 SomerFun is back for a second year of free fun and market-ery. This year’s festival will include a variety of games, activities, music, and independent vendors. Specific activities include a mixed-breed dog show (!!! ), a scavenger hunt around Union Square, farm and food demonstrations, and carnival games (dunk tank), as well as various live performances. There will also be booths of local and independent vendors, artisans, and nonprofits, as well as an art installation. 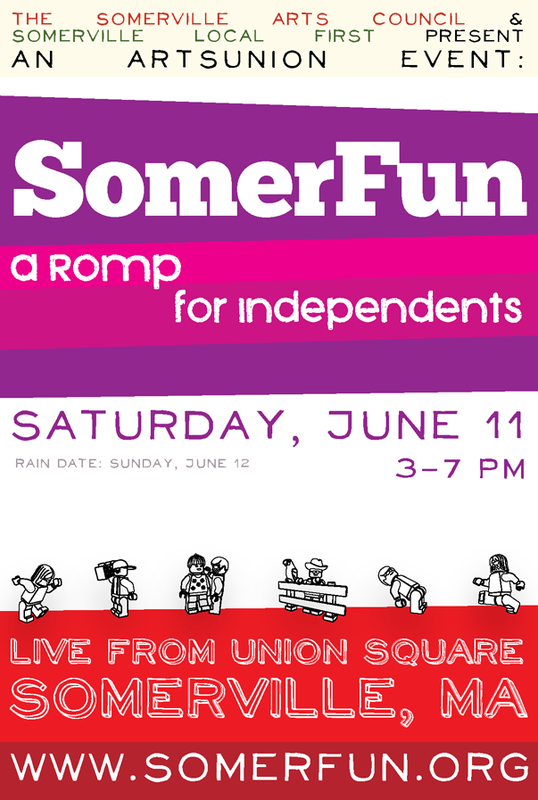 SomerFun has been organized by The Somerville Arts Council, Somerville Local First, the City of Somerville, and Artisan’s Asylum. Join four local singer/songwriters for an evening of original music at the Armory Cafe. The featured performers will be Hannah Devine, Jake Hill, Kayla Ringelheim, and host John Fuzek. Tickets are $10 at the door.